At least Johnny Midwest has a bag full of band-aids to apply to someones face after he rips it off with his exposed chain ring. Some of the things I see other than the super risers and a zip-tied toy (what is that from?) is a mix of Velocity B43 and Chukkar rims and a Fyxation Session 700 tire up front. Those 48′s look good now maybe think about a Pologuard. 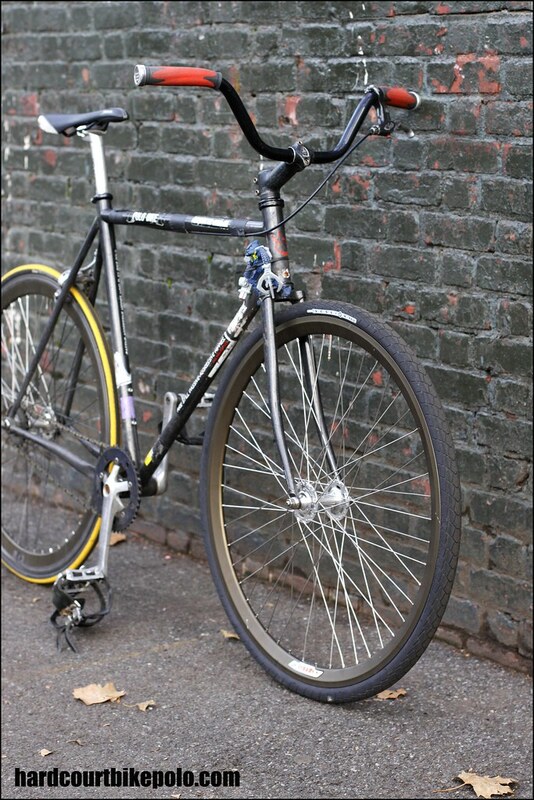 This entry was posted by Doug D on November 5, 2009 at 12:01 am, and is filled under Bike Polo, Bikes of Polo, Photos. Follow any responses to this post through RSS 2.0. You can leave a response or trackback from your own site. just grind those teeth off on that outer ring. done. he rides that gear home. just grind those teeth thru that outer flesh. done. interesting… looks like a 22 fixed on the polo side. how many teeth on the other side of the hub? fixed/free? 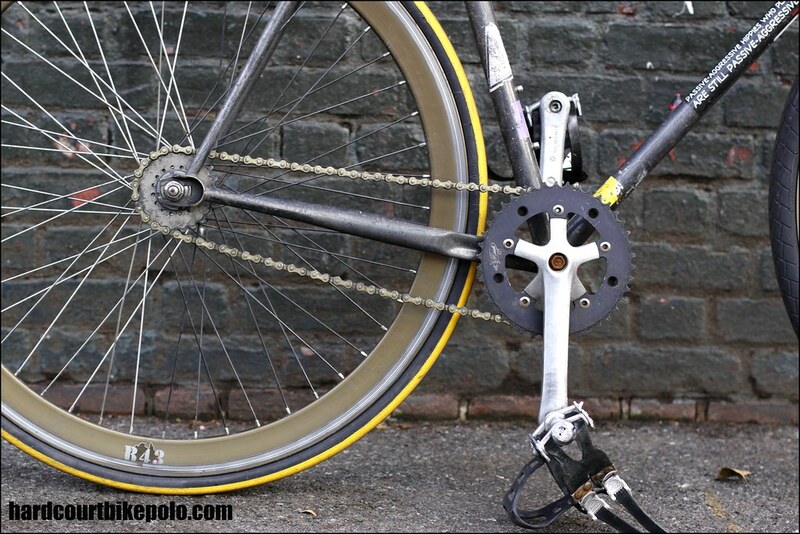 how many teeth on the inner chainring? is the chain line off and if so does it affect the ride (drop chain, etc)? i was thinking of doing a dual chainring setup with a surly dingle, but this looks like another solution. sorry for all the questions. maybe let johnny field these? 42/17 and 36/22. Axle position in the dropouts is basically the same. I’ve had this setup for about two years, and so far have ripped off zero faces. I haven’t even injured myself with it yet. Scratch that, today I gave myself a little cut on the ankle with it, that’d be the first time. Very happy with having the street gear (it’s a freewheel) option, it allows me to ride my polo bike all over the place so I don’t have to go home & switch bikes in preparation for polo.